Category: architecture, interviews, sustainability, urban design, What Does It Mean? Corrado Curti and Marcia Caines met with Tatjana Schneider, lecturer at the School of Architecture, University of Sheffield – where she teaches design studio, history and theory – in Torino following her participation in the international conference Qui è Ora: Spazio e tempo Pubblici on March 14/15 at the Fondazione Sandretto Rebaudengo in Turin. In 2006 Tatjana Schneider and Jeremy Till, then Professor of Architecture at the University of Sheffield, hatched Spatial Agency, a project that focuses on to putting people or ‘users’ first in architectural practices. Spatial Agency deploys the potential and knowledge of architectural processes to empower people to take control of the space they inhabit. Marcia Caines: Please could you tell us a little bit about the story behind Spatial Agency? Tatjana Schneider: While I was studying for my final degree at Strathclyde University in Glasgow my teacher Jonathan Charley instilled in me this idea that architecture could be more than what it actually is – more than ‘just’ building – and that was the beginning for me in thinking about, and also working on, other ways of doing architecture – for example with the workers cooperative G.L.A.S.. Since then my research and work has been dedicated to finding ways to engage with architecture in its context and take into account the multiplicity of voices that it has an affect on. In 2004 I moved to the University of Sheffield where I worked with Jeremy Till and Sarah Wigglesworth on a two-year research program called Flexible Housing – The Past, Present and Future, which – amongst other things – entails a comprehensive archive enlisting over 160 international projects that exemplify flexible housing i.e. dwellings that can adapt to the changing needs of users. It includes the possibility of choosing different housing layouts prior to occupation as well as the ability to adjust one’s housing over time. It also includes the potential to incorporate new technologies over time, to adjust to changing demographics, or even to completely change the use of the building from housing to something else. 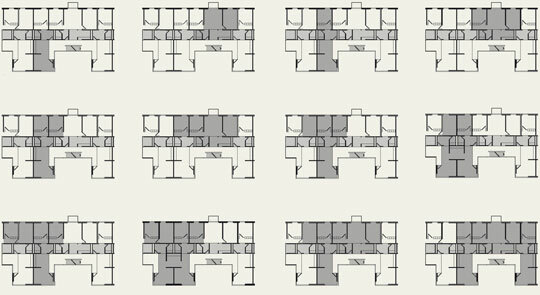 The outcome of our research is presented in the book Flexible Housing (Architectural Press, 2007). Expressing politics as a starting point of operation: Women’s School of Planning and Architecture, 1975. Ph: Courtesy Leslie Kanes Weisman. In late 2005, whilst still working on Flexible Housing, Jeremy Till and I developed another research project, which focused on the idea of Alternative Architectural Praxis that eventually led to the materialization of Spatial Agency in late 2006. You could say that, in a similar way to Flexible Housing, Spatial Agency also assumes an indeterminate approach to architecture. TS: Indeterminacy, I would say, is something that is open to exploring the possibilities of space; something that is unfixed from the start and retains an open position. An indeterminate approach means starting out from an open playing field and making a case for ‘not knowing’, not assuming to know what the outcome might be. CC: Does that mean unmethodical, or, to quote Feyerabend, “against method”? TS: I don’t understand Paul Feyerabend’s seminal work as proposing a position that is ‘unmethodical’, but as one that critiques a static and uniform notion of science and calls for a certain degree of irrationality. I understand indeterminacy more as a mindset as opposed to an approach. CC: So, it maybe described as an existential position rather than a conceptual one? TS: Yes, I suppose so. MC: How important is the ‘localness’ to the concept of Spatial Agency? TS: Very, in the sense that our spatial agents work with a situated approach, in which ‘context’ is core to prioritising the human needs of any specific place. MC: Coming back to your work with G.L.A.S. was this practice strictly UK based, or did you operate in other countries too? TS: G.L.A.S. 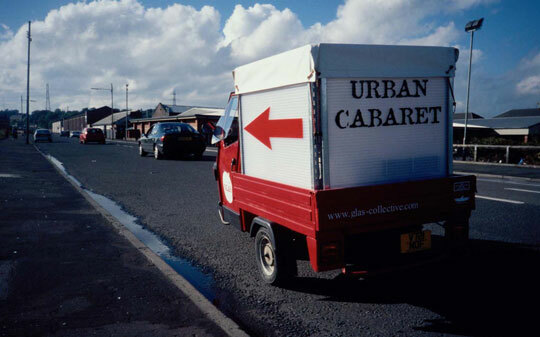 was based in Glasgow, but we worked in other European countries too and were connected to groups elsewhere through an extensive network. Each and every aspect of our work, however, was always embedded and situated in the local context. MC: How did you apply a situated approach across different countries and cultures? TS: We started afresh every time but always came with a set of principles that implied a position that wasn’t imposing. Our main aim was to listen to and engage with people with the ultimate aim to demonstrate what it might mean to be empowered. MC: What part in the participatory process is the most difficult? TS: I wouldn’t call this approach necessarily participatory – as the projects we did with G.L.A.S. often were quite short-lived. In longer processes, I would say that gaining trust is often the hardest part of the job. To often, people are simply exploited in the short-term and all those involved in a particular process need to be clear from the beginning about everyone else’s position and interests. Making things together, for example, is a key aspect throughout the various phases of operation. Indetermincay / Soft tactics: Überbauung Hellmutstrasse. ADP Architektur und Planung, 1991. CC: In Italy architecture as a discipline is often excluded from political and social discourse, even though in my opinion it should be integrated into these systems in order to become truly useful. Often, architecture isn’t considered part of the problem, but a consequence. How does this differ elsewhere? TS: I think this might be a relatively universal problem. Architects have marginalized themselves from these discourses – you might argue that they have never truly been part of them. One thing that certainly doesn’t help in defining a more ‘useful’ position for architects or other spatial practitioners is that architects in particular have been focusing on the building of objects for too long. One thing that certainly doesn’t help in defining a more ‘useful’ position for architects, or other spatial practitioners, is that architects in particular have been focusing on the building of objects for too long. CC: Today, the architecture practised by most studios is a market-led, daily toil, which is bogged down by paperwork and strangled by red tape. Successful practitioners, on the other hand, turn architecture into a wealthy commodity for affluent clients only. Either way very few ordinary people have access to architectural services on the whole. This condition is limiting architecture’s impact on humanity, which leads me to think that in order to perform responsibly architecture, as a social commitment, needs to be freed from architecture as an autonomous discipline. How do you view this reflection? TS: I am sceptical of painting everything black and white, to present this as two different and incompatible or non-related strands. Both positions are indicative of the same problem. Yet, at the same time, there are many shades of grey in-between the two poles you refer to – and this is precisely what we have been attempting to demonstrate with the project Spatial Agency. Nishat Awan, Jeremy Till and I have collected a vast array of international examples that show the potential of spatial engagement that is not measured by a normative understanding of ‘success’. The spatial agents whose work we simply put on display and show in context and in relation to each other demonstrate their ‘impact’ on society, make it obvious how architecture or spatial practice can reach beyond the normal scope of operation – sometimes in smaller, sometimes in larger and more wide-reaching projects. The practices and projects are evidence that the spatial is an inevitable expression of social and political conditions – conditions that cannot be ignored in practice. I’m maybe necessarily optimistic and idealistic on this. Architecture as a discipline needs to recognise on a much wider level that this is the only way to operate… In this scenario, I prefer to see the contemporary ‘starchitects’ as a dying breed – destined to irrelevance! CC: I like your optimism and share your idealistic vision on architecture. How, though can we find the space to promote social architecture? TS: Spatial Agency, for me, is one way of making ‘other ways of doing architecture’, which is also the subtitle for our forthcoming book, more visible. At the same time, it shouldn’t be forgotten that there are other extremely strong and often trans-national networks and collaborative endeavours that promote alternate, non-commodified notions of a production of space. CC: Participation has its limit in being confined to the design phase and often results in vernacular, simplified spaces. Flexibility and Open building tend to exorcise transformation through technological means. In some way both approaches fail to maintain the promise of a user-driven process. Could the possibility of shared-knowledge based on the Internet and open-source resources open up new paths of research for Spatial Agency? TS: I think that there are a lot of examples of participatory architecture that are not confined to the design phase and flexibility, as Jeremy Till and I discuss it in ‘Flexible Housing’, it supports an indeterminate approach – what we call ‘soft’ – over the more technological or ‘hard’. Open Building also has many facets. None of these necessarily have to be user-driven to be ‘successful’ – or at least not in all stages of the project. You could argue that to fixate a project on a current user is greatly inhibitive of long-term flexibility. So, I don’t necessarily share your pessimism when you say that these approaches have failed to fulfil or maintain a certain promise. 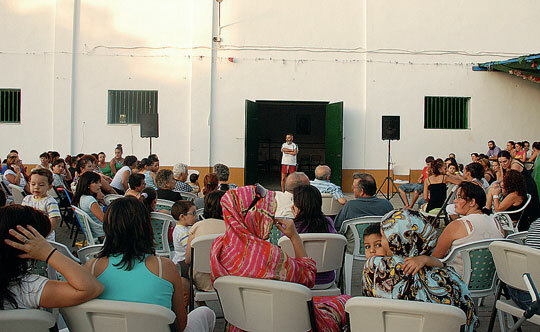 A village assembly in the coopertively run town Marinaleda. Ph: Sylwia Piechowska. I am sceptical of focusing too much on the Internet. For one, open source building is a much more complex aspiration than, let’s say, a Wiki – not only because open source building requires more ‘technical’ knowledge and language, but in that it might inhibit engagement rather than help it. The development of a shared vocabulary or shared language is a huge undertaking if done in an entirely virtual environment. It might be a potentially interesting idea, but for the time being, I see it working in conjunction with other analogue and face-to-face tools rather than replacing it. CC: Do you envisage users of space becoming active producers of space? TS: A participative or user-driven approach to the production of space is essentially one where the prospective user of, let’s say, a building, is involved in the design, development and production. Saying that, in my view a lot more needs to be done to make this positive interrelation between production and use more available, and increasingly possible for more people. I order to do that, people need to be confident about the role they can play in the production and this might affect change. Embedding architecture in a new way will afford communities benefits not only because it raises an awareness of the consequences certain actions and decisions will have. It is much more likely, for example, that active producers of space work with local products and local labour, because they can see the direct and immediate impact their actions have on the local economy – which in turn has an effect on the quality of their own lives. A participative or user-driven approach to the production of space is essentially one where the prospective user of, let’s say, a building, is involved in the design, development and production. MC: Don’t you think this is a bit simplistic? In reality people don’t just perceive architecture through glossy magazines, but actually consider architecture a sign of status, power and wealth, and this is nothing new. International events such as The Expo of Shanghai for example are literally about how countries use architecture to compete with each other in a global arena, meaning the economical implications far more deeply rooted and more complex. People aspire to wealth because they need to pay bills, but also as a means to freedom and prosperity. What’s your view? TS: You are right. A lot of people consider, and we can see this throughout history, architecture as a mechanism through which status, power and wealth are mediated. Expos and biennales everywhere, and other such events, are one of many tools used to ‘compete’. I’m not sure what these events are about as they only ever give a distorted, a constructed view of reality. It is important to be critical of this form of spatial production, as many are, but it is not the kind of spatial production that I am talking about (although it might be interesting to attempt an expo which is conceived in a very different and potentially bottom-up way). What I am referring to is the ‘everyday’ of architecture or spatial production. My approach is not one of social conditioning, but is about demonstrating evidence that might, and hopefully will, convince people that other approaches to the construction, the production of space are something to aspire to. CC: The traditional methods for measuring wealth also need to change – and are changing – it is already evident that a country’s PIL doesn’t mirror the quality of life within it. 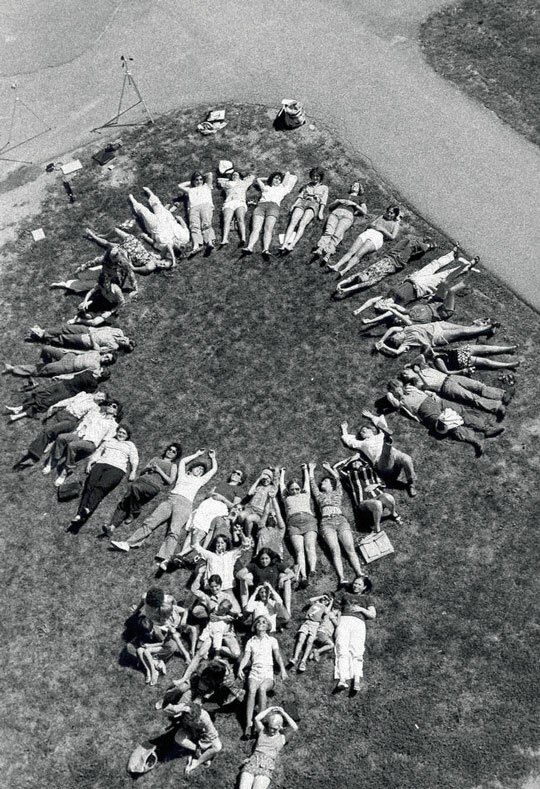 There are examples of alternative economics related to the urban condition, among them for example the Transition Towns movement. Are you involved in it? TS: No, I’m not involved in the Transition Network, but I know a lot of people who are. The concept was developed to equip towns and villages with tools that would help them deal with the changes that peak oil will bring. So, a very holistic solution to our dependency on oil – proposing alternatives to current consumption habits with a strong focus on local food production. CC: The documentation and analysis of Alternative Architectural Praxis contained within the Spatial Agency database forms a map of diverging paths which make use of different operative and conceptual tools such as: participation, empowerment of minor issues (e.g. based on gender, race, culture…) through architectural and urban design and action, detournement. Most of these tactics are reaction-tools that allow for a proactive response to unsatisfactory conditions. Is it the destiny of alternative practices to be tied to a peripheral and contingent – therefore temporary – condition, or do you envisage ways of achieving longevity and recognition without institutionalisation? TS: To start with, I would avoid the word ‘alternative’ altogether as it immediately positions the project in opposition to something. Alternative also implies that there is a definite centre. But, what is the ‘centre’ of present day spatial production? The second point I need to make is that Spatial Agency is not an operational or conceptual tool. Understanding it in this way is missing the point; it is not about finding a ‘market niche’ and then adopting certain operational principles in order to make a mark. For me, Spatial Agency is about a certain ideological position you take in relation to the production of space. There is a real danger in describing participation and empowerment as ‘reaction tools’ – they are positional starting points. Spatial Agency is about a certain ideological position you take in relation to the production of space. There is a real danger in describing participation and empowerment as ‘reaction tools’ – they are positional starting points. In the same context, these ‘other ways of doing architecture’ that we describe as part of Spatial Agency, operate in multiple conditions – some are more temporal than others, but I don’t see this as a detrimental factor. I would say that all of them deal with the contingent aspects of architecture, of spatial production. Whether they are peripheral or not relates to the perspective of the narrator, so to speak. None of the projects are peripheral to the people they concern, but a ‘mainstream’ architectural commentator might discuss them as peripheral to his or own system of reference. 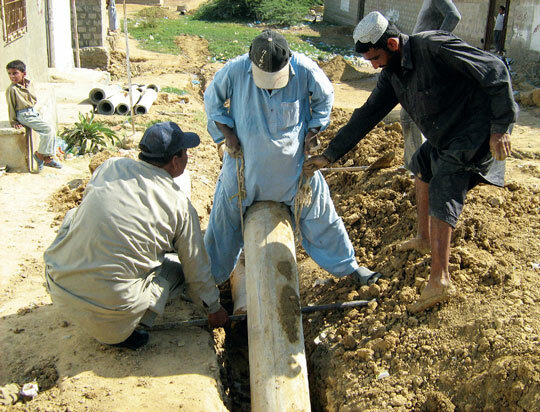 Empowerment of others to organise themselves as driving force: The Orangi Pilot Project (OPP) in Karachi, Pakistan. Ph: OPP-RTI. Recognition is yet another discussion, but again involves questions about whom we would like these ways of operating recognised by? By the general public? By the educational system? By the professional bodies? By the political system? Each of these questions has a particular set of issues and possible responses. CC: Do politics have a negative connotation in these new architectural practices? TS: For some yes, for some no. CC: I tend to see the role of the founder as a key factor in the success and survival in such practices. Would you agree? TS: Firstly, we probably need to define what we understand by success and whether ‘survival’ is a necessarily positive condition – something to aspire to. The practices and ways of operating I’m interested in are not too much concerned with this notion of a ‘founder’ figure, but often work in ways that are co-operative or non-hierarchical and therefore frequently work against this otherwise very common notion of the important individual or ‘hero’ architect. CC: Which brings us back to the importance of continuity and life span, in particular in relation to changing needs and the active appropriation of buildings by users. How important are they? If buildings are designed to last for a considerable period it is important to consider how knowledge in relation to a building’s potential for adaptability is passed on – keeping in mind that the initial designer or user won’t be around forever. It is therefore crucial to think carefully about the use of any technological systems and how these are operated, how they can be updated, et cetera. In relation to use, scenario planning helps to consider different ways of occupation and, in relation to construction, legibility of load bearing and non-load bearing elements, knowing for example almost intuitively which parts of a building might be changeable, promotes self-directed adaptation. The only thing that seems to be certain in building or the production of space is that there is hardly any continuity. And, yet, if buildings continue to be produced to last for several generations, uncertainty and contingency need to be taken into account so that what Anthony Giddens calls ‘acting otherwise’ – both in relation to a building’s use and user – becomes more than an afterthought. CC: In the article on Spatial Agency featured in Footprint, time, as dual to responsibility, is given a central role in the definition of agency itself. The time-span of a building often takes a back seat in architectural practice and research, likewise a building’s capacity to transform according to contingent and the changing needs of its inhabitants is often perceived as a threat to the authorial right of the architect. In recent years the widespread attention to chaos, complexity and dynamic models invested in design tools and processes has not affected the static-work-of-art of the building, in striking contrast to the everyday experience of restless transformation demonstrated by the built environment (I directly refer here to examples like Pessac). Would you agree in considering the transformation of the built form as a possibility to shift architectural practice from the traditional perspective – based on control and pre-determination of form and functions by the architect – to an open-model of architecture? TS: Jeremy Till and I write that if a building and its users, the non-human and the human, are treated as separate agents, there is the danger that responsibility of one for the other is lost. Space is temporal; it is not static but dynamic. Taking time, taking this temporality in spatial production seriously is maybe the first step towards a production of space that is continuous and not predicated on the single moment of completion. Space is temporal; it is not static but dynamic. Taking time, taking this temporality in spatial production seriously is maybe the first step towards a production of space that is continuous and not predicated on the single moment of completion. CC: A curious aspect of the architectural discourse is its ability to hide the architect’s role as active agent of power systems behind the double curtain of autonomy and technicality. A key-role is played by standards and codes, whose apparent “scientific objectivity” disguises strong political and social statements. How can we think of different ways to manage the process of space production, what innovative normative tools could be developed and tested? TS: I’d like to point again towards the project Spatial Agency. There is a myriad of ways to engage in the process of spatial production and for some groups it is in particular building regulations and building codes which become a starting point for a critique of the production of the built environment. Jeremy Till, Nishat Awan and I write in our forthcoming book ‘Spatial Agency. Other Ways of Doing Architecture’ that the standard tools of aesthetics and making are insufficient to negotiate today’s social, global, ecological and virtual networks and that spatial practitioners need to engage with a new set of tools. Opening up to other tools – tools that are outside the typical architectural comfort zone – might also lead to a form of practice, which is less insular and allows it to become open for other influences and other voices. Sérgio Ferro, for example, has argued that the typical architectural tools have secluded architecture from spatial dynamics. The tools that are necessary to ‘rescue’ architecture from its present condition are again very situated – we talked about this before; tools as much as projects need to be specific to a certain context or locality. It is again important to stress that tools do not become a means to an end but that they become transformative mechanisms to alter previous forms of production and mediation. CC: Agency, as defined in your research, is linked to practice and direct action. Experimental Architecture, as defined by the works and research of Lebbeus Woods and RIEA, is based on the use of the architectural project as a tool to explore alternative futures for specific, critical conditions. Would you consider this approach – which bears some similarities with the idea of unsolicited architecture – as a form of agency? How would you define the architectural experiment in the light of Spatial Agency? TS: In relation to the first part of your question, Spatial Agency as defined in our project works in the interrelationship of spatial judgement, mutual knowledge and critical awareness. Spatial judgement as opposed to spatial intelligence, for example, prioritises the social aspects of space; mutual knowledge refers to a willingness to share knowledge in an open manner with all concerned as well as to respect the knowledge of others; and, critical awareness refers to an evaluative stance, which also takes into account the necessity to be self-critical. So, all projects which we included as part of Spatial Agency are somewhat practical in character, but never exclusively so – otherwise they would not have made our selection; and, some projects have an element of direct action, but most haven’t. Projects that were included have an element of all three criteria – spatial judgement, mutual knowledge and critical awareness – and that is why we didn’t include the examples you mention. In the same spirit, to answer the second part of your question, I’m sure you will find a lot of experimentation in the examples that are part of spatial agency although it isn’t a necessary condition – many groups and projects test new ideas, many of them try new concepts and ways of doing things, others make new sense of existing concepts. An architectural experiment, as any other work within our framework of and for Spatial Agency, employs and works within the three criteria. CC: Thank you for your time Tatjana.